His is the fifth member of the Sanzo Ikkou, the one who continues to journey carrying the four noisy men on his back. 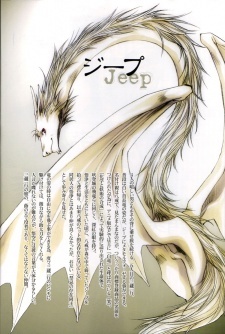 Usually he appears as a white long-necked dragon, but can also metamorphose into a Jeep. The parent figure to name him was Hakkai, but as you can see, in the anime and such he is mainly called "Hakuryuu" [lit. "white dragon"], as he was unthinkingly named after a product with a registered trademark. He is a creature created in an experimental "combination of science and youkai magic", and so has crimson eyes like the flying dragons of Houtou Castle. While still living with Gojyo, Hakkai found the weakened Jeep in the forest and brought him home. Ever since, Jeep has been something of a pet to Hakkai. He didn't get along very well with his housemate Gojyo, but the two compromised as they are both "taboo existences." In the manga, his name is "Jeep," while in the anime, it's "Hakuryuu".